Advanced Physical Therapy Center (APTC) announced that it will partner with University of Michigan’s PT Heart Program to host the “Longest Day of PT”. The event will take place at APTC’s Grand Blanc clinic for 24 hours on Wednesday, July 1st at noon to Thursday, July 2nd at noon. The goal is provide awareness for the physical therapy profession and a mentorship for the students from the U of M-Flint PT Heart Program. The Longest Day of PT event will be staffed by the students of the PT Heart Program. In exchange for the students’ participation, APTC therapists will mentor the students, and APTC will give a donation to the PT Heart clinic. In conjunction, APTC and the PT Heart program are hoping to achieve the world record for the longest day of physical therapy. Each patient who participates in the event will be given a free consultation, advice on their condition and injury prevention, recommendations, and a home exercise program. In order to participate, a patient will need to call APTC-Grand Blanc to make an appointment. The PT Heart Program stands for Physical Health Education and Rehabilitation Treatment and is a student led, pro-bono clinic located in the Catholic Charities North End Soup Kitchen. Their mission is to create an environment of health and learning for all who enters its doors, including the insured and uninsured. The goal is to provide excellent care through evidence based intervention, patient-centered services, education, and collaboration between patients, students and practitioners. 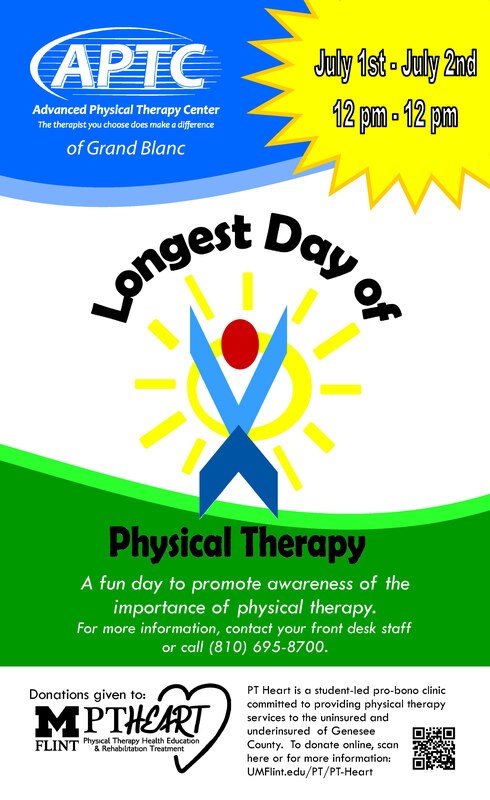 For more information about the Longest Day of PT, contact Kristin Molzon at Advanced Physical Therapy Center. For more information about PT Heart, contact Rachel Miceli at PT_Heart@UMFlint.edu.